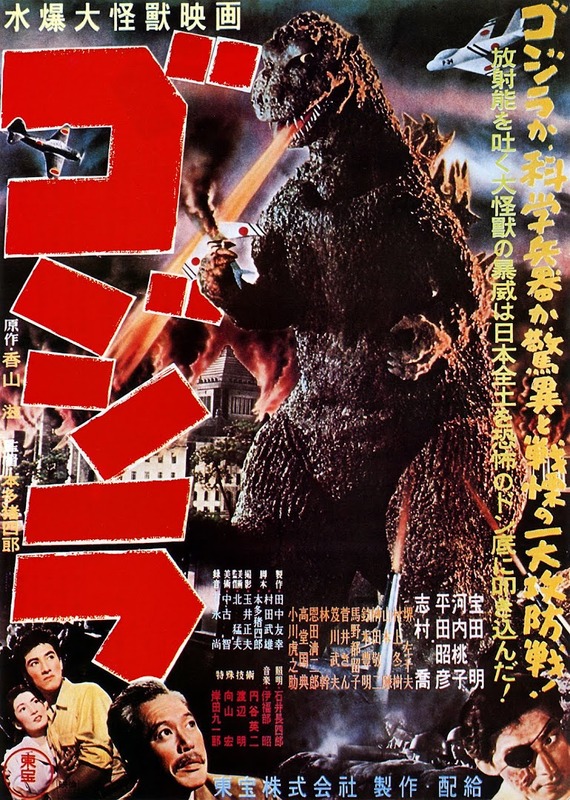 The twenty-first of April 1943 was a big day for the two generations of the Tourneur film-making family. 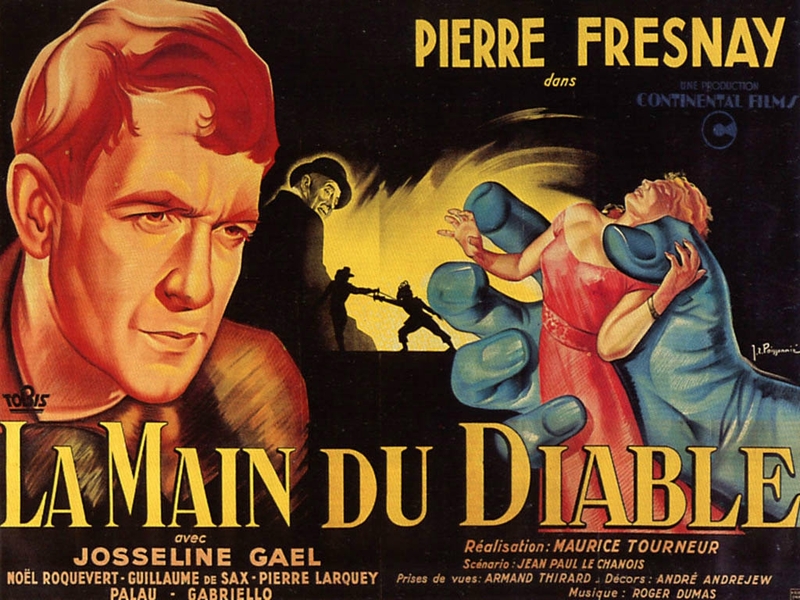 On the same day that director Jacques Tourneur’s second film for producer Val Lewton opened in America - I walked with a Zombie - across the Atlantic in France his father Maurice released the equally dark and otherworldly La Main du Diable. 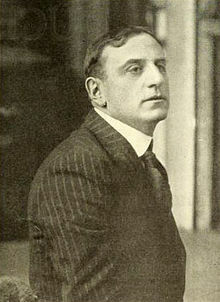 Born in 1876, Maurice Tourneur was a former theatre actor who entered the film world as an assistant director for the Éclair company in 1911. Before the decade was over, he had shipped over to America’s east coast and soon took charge of his own silent features, for Éclair’s New Jersey offshoot and then the World Film Corporation, including crime drama Alias Jimmy Valentine (1915). By the early Twenties, Tourneur firmly believed that Hollywood was the centre of the industry. Having already taken American citizenship, he moved out there to establish himself further as director of The Christian. This tale of doomed love (starring Richard Dix, later to topline Val Lewton’s The Ghost Ship) would be sadly imitated in life as Tourneur’s marriage collapsed soon afterwards. In 1928, his U.S. film career also hit the rocks; M-G-M sacked him from Mysterious Island over his painstaking commitment to the beauty of the shot. He was forced to return home to France and start again. 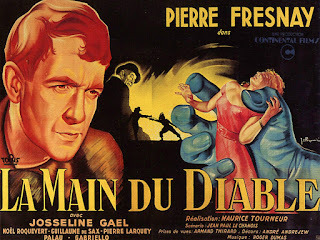 Diable (known in English as The Devil’s Hand and Carnival of Sinners) starred Pierre Fresnay, an actor of note from Hitchcock’s first version of The Man who Knew Too Much (1934) and a lead role opposite Erich Von Stroheim in Jean Renoir’s famous war drama La Grande Illusion (1937). It’s an engrossing Faustian morality tale made with great stylistic touches warning against the dangerous seductiveness of easy unearned fame. Fresnay plays Roland Brissot, a tormented man on a personal mission who appears one night at a hotel in a mountainous region of France, bringing terror and intrigue into the lives of the other guests who are stranded by an avalanche. He is missing his left hand and carries a little casket that he zealously guards. Frustrated at discovering that a cemetery he seeks is not nearby, he is further perturbed when two rifle shots are heard and police officers turn up, seeking a diminutive man in black matching his description bearing a coffin. Suddenly there is a blackout during which Brissot’s box is stolen. The locals’ suspicions about him prove greater even than his mounting stress until eventually he calms enough to give them a deserved explanation. He tell them the incredible story that led him there. Tourneur gains solid performances from his cast, led by the harried Fresnay who we discover is a painter of large ego but small talent, dismissed by the cognoscenti as “the painter of perfume and vitamins”. His inciting relationship, that of gold-digging girlfriend Irène, is finely portrayed by Josseline Gael, who he picks up one day as a sales girl in a glove shop. She becomes his model yet soon realises his potential can’t live up to her selfish dreams of reflected glory and leaves him. The café chef Mélisse (Noel Roquefort) overhears the break-up and offers Brissot an extraordinary solution, a talisman that will bestow on him the fulfilment of whatever skills, talent and success he can dream of - in return for just one penny. The talisman is a creepily mobile left hand nestled in a casket, and acts as a supernatural conduit channelling transformative power for its owner when it replaces his own. It’s a strange bargain indeed as Mélisse combines his outlandish claims with the most chilling of buyer beware warnings. The absurdly cheap price is because each owner is also cursed from the moment he takes it up (“Sell it before you die!”) and only by selling it at a lesser cost than he paid can the former possessor be saved eternal damnation in Hell. As with all Faust propositions, in his greed Brissot ignores the small print and buys the talisman, much to the elated relief of the chef (who doesn’t tell Brissot that since there is no smaller coin than a penny he won’t be able to sell it on himself). Mélisse doesn’t get away scot free though - at the moment the deal is sealed, his left hand is reduced to a stump. Over the next year, as predicted Brissot’s occult handiwork turns him from scorned failure into the critics’ darling. A revealing scene at his latest exhibition illustrates the motto of success having many fathers as exhibitor Gabelin (a fittingly self-satisfied Guillame de Sax) competes with Irène to hijack credit for Brissot’s success for themselves. The artist has other concerns. The ideas behind his disembodied work are a mystery to him, as is the hand signing each canvas enigmatically as ‘Maximum Leo’. What bothers him more is an odd little man who follows him around with a seeming knowingness, taunting him with an In Memoriam wreath commemorating for his new pseudonym. All becomes dreadfully clear when they meet. The bowler-hatted civil servant hides the far more sinister identity of the Devil (a mischievous turn by the actor Palau - Pierre Palau del Vitri). His benign twinkling exterior is reminiscent of Walter Huston’s Scratch in the similar The Devil and Daniel Webster (reviewed here) yet here is even more wicked in true intent. ‘Le petit homme’, as he is credited, starts a fiendish clock ticking by telling Brissot that from now on, if he wishes to save his soul from Hell’s claim, he can buy it back but every day’s delay doubles the debt. This would be easy were it not for Brissot’s equal desire to buy the continued affections of the fair weather Irène. This plot development in Jean-Paul Le Chanois’s script is a gripping and fresh take on the classic Faustian bargain, trapping Brissot in a nightmare escalation of self-induced business debt that the 1990s real world would ride with sweaty-palmed vicariousness alongside Rogue Trader’s Nick Leeson. Twenty-three days into the interest agreement, Brissot feverishly scrambles to put together enough buyout funds on a Saturday night when the figure is already over two hundred thousand francs. Seeing he is just eight francs short, the cruel little Devil spins the clock beyond midnight to double the debt further. By the time he owes over six million, Brissot is so frantic that he takes the advice of Angel, a man who’d shouted “Don’t buy it” in vain back when he bought the hand, to turn his gifted hand to the roulette wheel at Monte Carlo. However, that rascally Devil is on to him and cools Brissot’s winning streak by simply showing up. As with his son’s films under the literate humanitarianism of Val Lewton, Tourneur adds a vital moral guide post in Brissot’s darkest hour of despair: a kindly croupier at the casino who arranges a ride home for him. When asked why he wastes sympathy on such a foolish customer, the self-piteous Brissot is told “All men support each other like the links of a chain. When a link breaks, it breaks the next one”. This crucial bond of care (albeit enlightened self-interest) is then illustrated to greatest effect in La Main du Diable’s most memorably macabre sequence, a ghostly counsel composed of the chain of men united by ownership of the accursed talisman. They convene to help Brissot, and ultimately their eternal selves. Each man recounts their shared experience of his supernatural gain followed by a sickening fall from grace requiring the desperate selling on of the hand. They are in turn a King’s musketeer, a pickpocket-forger, a juggler, illusionist, surgeon, a boxer and finally Mélisse the chef. 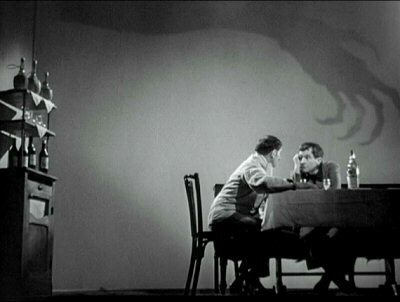 Tourneur’s montage of their lives is a mini-masterpiece, using Expressionist backdrops, silhouettes and shadows to visually depict the encroaching terror of consequences (e.g. the sloping wall and door of the pickpocket’s cell, and the long clawed arm overhanging the fateful deal between Mélisse and Brissot). 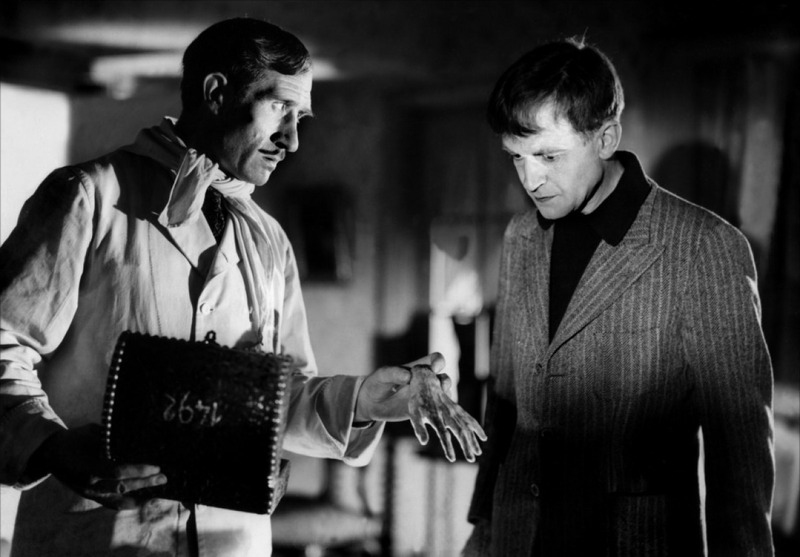 Painstaking detail like this for such brief screen time may well have cost Tourneur his Hollywood career, but the thrilling mindscape he creates here was to French cinema and future horror audiences’ benefit. Finally, the men are visited by the saintly soul who unwittingly gave his name and extremity to the awful chain of events. Against a holy sunburst background comes the spectral form of a fifteenth-century monk, the real Maximus Leo, who shunned using his many God-given talents in favour of the secluded hermit life. Seeing the bargaining potential literally at hand, the Devil cut it from him. Now the benevolent Maximus has returned to save their souls. One by one, symbolically chanting “Rest in peace”, the men pass the talisman casket down the bloodline that links them - until it stops with Brissot. He must fulfil its last resting place at the cemetery that holds the monk’s tomb in the mountains where our story began. Brissot runs from the hotel and finds the graveyard after all. As the locals watch from the distance, he engages in mortal combat with his little nemesis. By the time they reach him, though he has died of a bludgeoned skull, the casket has vanished, reunited once more with Maximus Leo’s coffin and ending the curse’s deadly temptation. 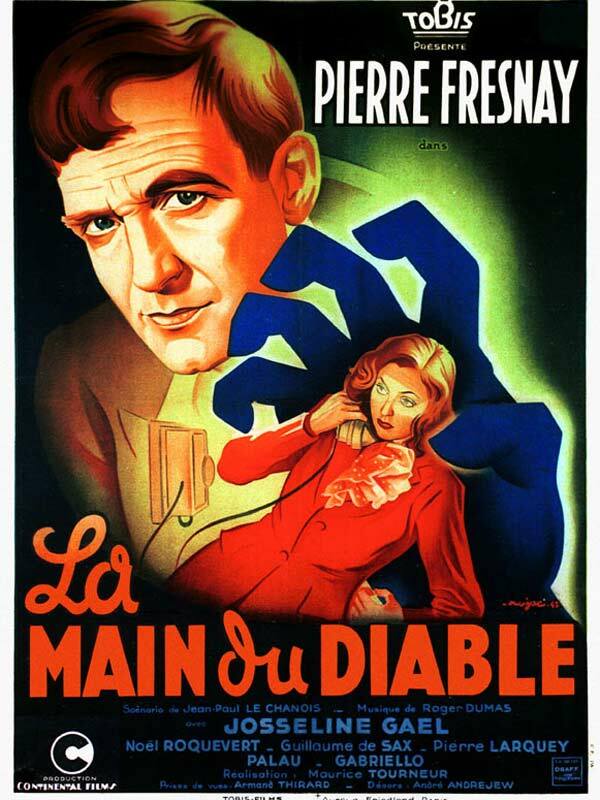 La Main du Diable is an excellent combination of suspense thriller, chills and religious mysticism that charitably redeems us for our weaknesses and the reputation of a distinctive film director.